We’re rounding the corner into December already. I hope everyone had a pleasant and safe Thanksgiving weekend. If you want to plan ahead beyond Dec. 13, the full December program page is available. In addition to special events, please note that winter seasonal schedules continue to be phased in this month, so be sure to check ahead before visiting. Dec. 1: Exhibit opening—”Anthracite Photographers: Photographers of Anthracite” explores over 140 years of photography in Pennsylvania’s hard coal region (read more on Facebook page). An opening reception, sponsored by Misericordia University, will take place at 2 pm (museum admission will be free on 12/1 from 1 pm onward). Museum open 9 am-5 pm. Dec. 1: Christmas at Cornwall House Tour—this annual tour lets you explore private homes in the Cornwall/Lebanon/Mount Gretna area (info on this year’s homes) while supporting the Friends of Cornwall Iron Furnace. Tickets are $15 in advance at several locations in the community and at the Furnace. Tickets are $20 on the day of the tour and are available only at the Iron Furnace. Your ticket includes a guided tour of the Furnace, which you may redeem during regular operating hours up through Dec. 29, 2017. Light refreshments will be offered throughout the day at the Furnace. 10 am-4 pm. Dec. 7-8: Christkindlmarket—crafts, wine, candlelight, and shopping (details on the Boone home page). Admission is $7 for ages 12 and up (members pay less). Check website for info on combo ticket ($10) with the “Christmas at Johanna Furnace” event. Tickets available by calling 610/582-4900. DBH event is 4-9 pm both days. As of Dec. 1, tickets are on sale for this year’s Lantern Tours, scheduled for Dec. 26-29 (more info on website). Dec. 10-11: Christmas at the Cloister—this popular annual program combines seasonal readings and traditional music performed by the Ephrata Cloister Chorus in the 1741 Meetinghouse (Saal). Performance times are 6:30 and 8 pm each evening. Tickets are $6 per person and seating is limited. Purchase tickets from the Museum Store by calling 717/733-2592 or order by mail (see website for instructions) You may also want to keep an eye on the Facebook event page for updates on ticket availability and to see a video. Dec. 6: Gingerbread House Workshop—you’ll work with a kit and receive instructions and then you’ll be free to let your creativity loose (more info on website). Light refreshments will be served. Cost is $15 per person. Space is limited. Prepaid reservations required; contact Beth at beth.maccausland@gmail.com or 215-915-9453. 7-9 pm. Dec. 1-2: Country Christmas Village—this year’s event has a new twist, exploring Christmas as seen in books and stories by Laura Ingalls Wilder, Louisa May Alcott, O.Henry, and others (more info on the website). What influence did Pennsylvania German traditions have on these classics? Children can learn about the history of Santa Claus and (with parental permission) post a letter to Santa at the Landis Valley Post Office ($1 postage) and receive a reply from the North Pole. Musical entertainment will be provided in the Yellow Barn (different performers each day). The Museum Store will be hosting their annual Artisan Showcase with loads of handcrafted goodies. There is no charge to visit the Museum Store. For everything else, admission is: Age 12-64, $12; age 65+, $10; age 3-11, $8; LVA members and age 2 and under, free. Online ticket purchase available via Brown Paper Tickets. Saturday, 10 am-4 pm; Sunday, noon-4 pm. Dec. 8: Meet Belsnickel—he’s grumpy but you know you want to meet him. Belsnickel (a PA German tradition) will be on hand and receiving visitors. You’ll also be able to decorate cookies and enjoy some cold mulled cider. Cost is $5 per person. Reserve your spot by calling 724/266-4500 x113. 11 am-2 pm. Dec. 8: Deadline to register—two of OEV’s regular blacksmithing demonstrators will teach an intermediate blacksmithing class on Dec. 15. Class is free but space is limited and you must register by Dec. 8. Contact David Miller at davmiller@pa.gov. 10 am-1 pm. 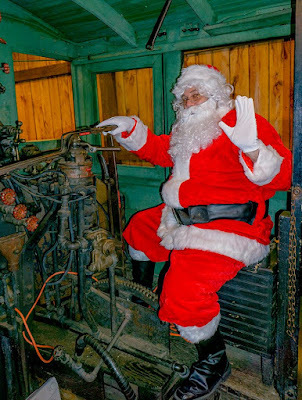 Dec. 8: Santa in the Shay—St. Nick will forgo his sleigh in favor of a geared locomotive as he listens to children’s requests. Take an instant photo and turn it into an ornament, browse unique gifts from local artisans and the museum store, and enjoy hot cocoa (Facebook event page has details). Admission is $5 for adults, $3 for kids. Noon-4pm. Dec. 7: StoryTime—visit the museum’s Transportation Gallery and read Little Plane Learns to Write by author/illustrator Stephen Savage. You’ll also make a small plane of your own to take home. Included in general admission and intended for children age 3-5 with an adult. 10-11 am. Dec. 13: Nature Lab—in today’s program, “Pre-Historic Deer (Cervids),” learn about the ancestors of today’s white-tail deer and Santa’s reindeer with curator of paleontology, Dr. Steven Janiski. Included in general admission. 11:30 am-12:30 pm.